The historic Congress announcing the reunification of the subjects of Dianetics and Scientology with the release of Dianetics 55! 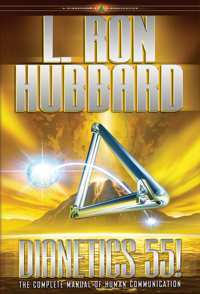 Until now, each had operated in their own sphere: Dianetics addressed Man as Man—the first four dynamics—while Scientology addressed life itself—the Fifth to Eighth Dynamics. The formula which would serve as the foundation for all future development was contained in a single word: Communication. 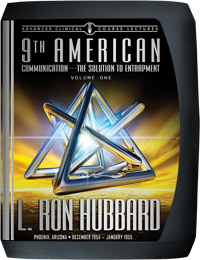 It was a paramount breakthrough L. Ron Hubbard would later call, “the great discovery of Dianetics and Scientology.” Here, then, are the lectures, as it happened. In the fall of 1954, word spread that L. Ron Hubbard would be addressing a unique Congress—one sponsored both by the Hubbard Dianetics Research Foundation and the Hubbard Association of Scientologists International. 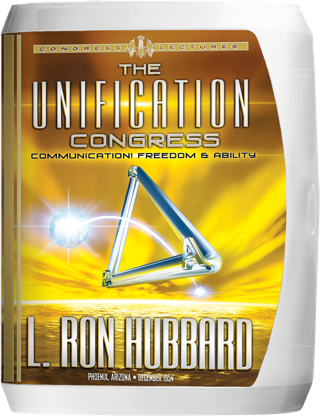 The joint sponsorship was significant, for it signalized the reunification of Dianetics and Scientology, both physically and philosophically. Before this time, each subject had operated independently. 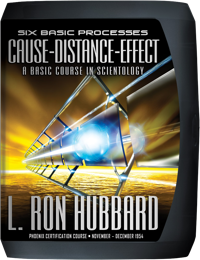 Dianetics addressed Man as Man on the first four dynamics, while Scientology dealt with all of life—embracing the Fifth through Eighth Dynamics. And so, on December 28, 1954, a capacity audience gathered in Phoenix, Arizona, for the Unification Congress. It was described by the Journal of Scientology as “the most important thing that ever happened in Dianetics and Scientology events,” and the words were apt. Thereafter, both subjects would advance in tandem. And to just that end, he revealed the next step—a breakthrough that would not only revolutionize auditing but the entirety of human relationships. That breakthrough was the previously unknown Communication Formula—exact principles that defined, for the first time, perfect communication. 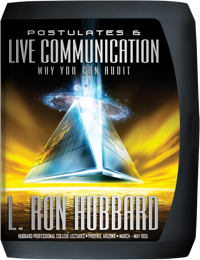 In these lectures, Mr. Hubbard not only defined the application of the Communication Formula in session, but as regards an individual’s communication with others, with himself, his body and the physical universe. Those discoveries thus embraced and clarified the mechanics of games and entrapment, why the physical universe persists, and even why a being has a Reactive Mind. 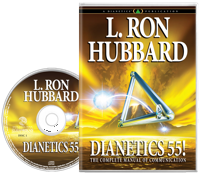 So important were these lectures that recordings were extensively toured to organizations internationally to provide all Dianeticists and Scientologists the technology L. Ron Hubbard would later refer to as the great discovery of Dianetics and Scientology. For the magic of the Communication Cycle, revealed at this Congress, is the fundamental of auditing and the primary reason it works. Here, then, are the communication breakthroughs underlying all of life.